In the Meridian Editor, Beacons Management provides greater control over the Beacons deployed to your location. Combined with the Beacons app, Beacons Management gives you the tools you'll need to track and edit your Beacons remotely. With Beacons Management you can review your deployed Beacons, track Beacon battery levels, and edit Beacon values. An Aruba wireless network communicates with the Meridian Editor over HTTPS on port 443. If you're using a firewall, please make sure traffic is permitted on port 443. 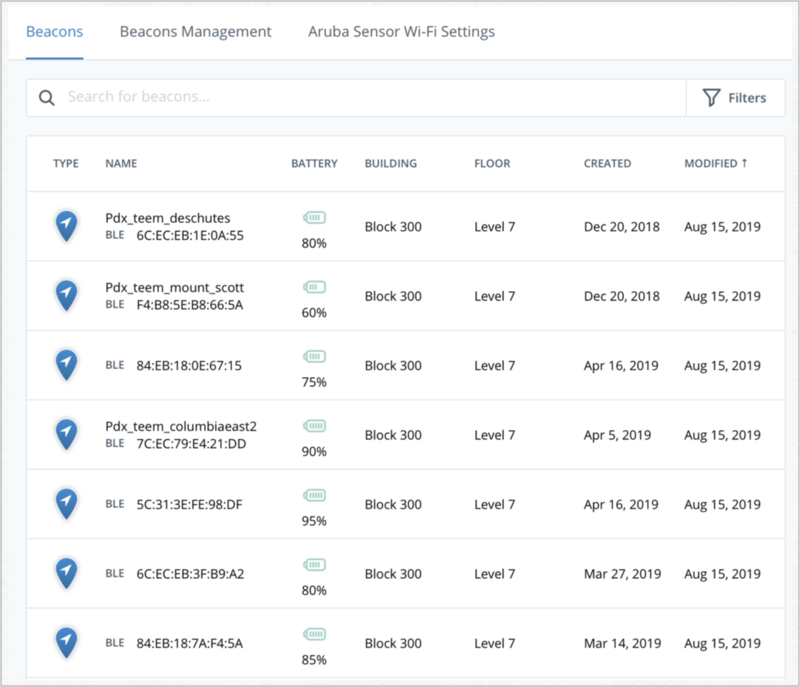 When Beacons Management is enabled for a location for the first time, APB Auto-Deploy will configure all of the undeployed AP Beacons for that location, making them available for placing on a map. To get to Beacons Management, in the Meridian Editor sidebar, click BEACONS to see the Beacons List for your location. Beacons Management shows a list of all of the Beacons and Access Points (APs) configured for your location. Click a Beacon row to go to that Beacon's detail page. In the Beacon Search for beacons field, you can search for Beacons by user-defined name and by MAC address. You can use Beacon search filters to refine your search. Use the Beacon search filters to refine your Beacon search. Click the Filters button to see the search filters. In the Map filter section, you can filter by building and map level. You can also choose whether to see Beacons in a list or on a map. Click the BUILDING dropdown and then choose a building name. Click the LEVEL dropdown and then choose the map level you'd like to see. Check the VIEW ON MAP checkbox to see the Beacons on the map level you chose. Check SCOPE SEARCH TO MAP BOUNDS to limit Beacons to those that are actually on a map. In the Beacon filter section, you can filter by Proximity or Location Beacon. Click the TYPE dropdown and then choose either Proximity or Location. In the Access Point Beacon section, you can filter for APBs or unplaced Beacons. Check the ACCESS POINT BEACON checkbox to see only APBs. Check the UNPLACED checkbox to see Beacons that haven't yet been configured and deployed to a map. In the Created section, you can filter Beacons by creation date. A Beacon is considered created when it's first turned on and configured and deployed to a location. To set a date, click the calendar button, and then choose a date. You can also enter dates in the format mm/dd/yy. CREATED AFTER will show Beacons created after that date. CREATED BEFORE will show Beacons created before that date. In the Modified section, you can filter Beacons by modified date. A Beacon is considered modified when one its settings is changed, such as type or power level. MODIFIED AFTER will show Beacons modified after that date. MODIFIED BEFORE will show Beacons modified before that date. To remove a filter, click the X next to the filter name you want to remove. The Beacons List page is a list of all of your location's Beacons. The list includes Beacon type icon, name, BLE MAC address, AP MAC address (for APBs), building, map level, created date, and modified date. All of the columns are sortable. Click a column header to sort by that field. Beacons can be either a Location Beacon or a Proximity Beacon. APBs can be configured for Location or Proximity and their icons are red. Location Beacons are used to locate your visitors on the map. Proximity Beacons are used to send push notifications to your visitors. The NAME column shows the name (if there is one) and any MAC addresses. The MAC address is the unique identifier for each Beacon. APBs will show an additional MAC address. If a Beacon has been named, the Beacon name will appear above the MAC address. Click a Beacon's MAC address to see its detail page. In order for your Beacons to communicate with the Meridian server, you'll need them to communicate with your Aruba wireless network. This generates the Access Token you'll need to configure your Aruba wireless network so that your access points will recognize your Beacons and communicate with the Meridian Editor. Only organization-level users can generate access tokens. When Beacons Management is enabled in the Meridian Editor, a location's wireless network will start to report current Beacon status to the Editor. When a change is made to a Beacon's type or power level using the Editor and a user clicks Save, that changeset is staged. When an Aruba wireless network picks up that changeset, it then sends it to an AP connected to the Editor that's currently observing the Beacon. When the changeset is picked up by the Aruba wireless network, the status changes from Staged to Pending. The changeset is completed when the AP successfully updates the Beacon with the new settings. On the Editor's Beacon Management detail page for the changed Beacon, it will show "Staged Beacon Update" or "Pending Beacon Update". The Created line shows when the Beacon changeset was staged on the Editor. The Pending lines show how long it's been since the Beacon changeset was sent to the Aruba wireless network. It tends to take about 5 minutes for a Beacon's changeset to be completed. If the Pending time is much longer than that, there may a network connectivity issue preventing your Aruba wireless network from connecting to the Editor. Alternately, a stale changeset may simply be a single Beacon that can't be observed by an AP.